The way that turtles evolved into their modern form, with a shell fused to their skeleton and a beak-like face without teeth, has been described as "one of evolution's most enduring puzzles." How did the turtle get its shell? It sounds like the start of a fable, but it's something scientists have wondered for years, and new fossil research is providing some clues. Relatively few fossils of early turtles have been found, leaving it a mystery how the creature developed its unique features, and even which ancestors they evolved from. But new research published Thursday in the journal Nature fills in some gaps by examining a turtle fossil discovered in China that dates back 228 million years. The skeleton has a beak, but also some teeth, suggesting it may be a "missing link" in the evolution from an earlier toothy turtle to today's form. "This is the first early fossil turtle with a beak," said Chun Li, a researcher at the Chinese Academy of Sciences in Beijing and co-author of the paper on the fossil dubbed Eorhynchochelys. "The interesting thing is that although a beak had developed, the teeth were preserved, so it is a half-beak, half-toothed jaw -- an excellent transitional characteristic," he told AFP. The fossil is also large, at 2.5 metres long, with a lengthy tail and broad and flat ribs along its back that appear to have formed a disc-like precursor to a shell. With so little evidence to go on, one of the great debates over turtle evolution is just which animals they evolved from. 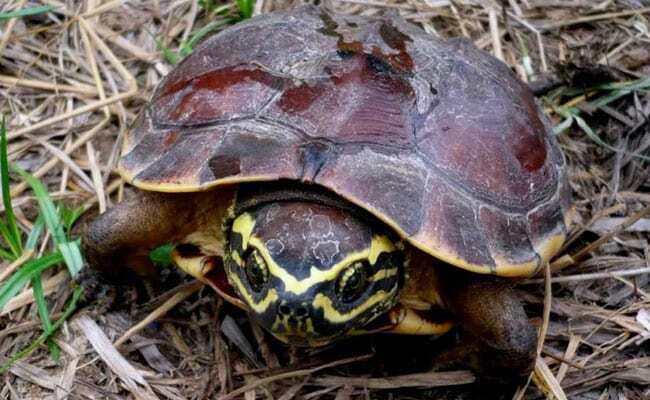 One theory holds that they share the same common ancestor as most reptiles, but some experts argue the shape of a modern turtle's skull means this is unlikely. Chun said the shape of the bones in the new fossil lends weight to the idea that turtles evolved from the same ancestors as most reptiles, calling the specimen "an important missing link in the early evolution of the turtle." It follows a handful of other discoveries in recent years, including a 220-million-year-old specimen with with a fully-formed underbelly covering but no shell on its back and a 240-million-year-old fossil with no shell at all. Chun has spent the last 20 years studying reptile fossils in China's Guizhou province, where the 220-million-year-old turtle was also found. But he stumbled upon this latest fossil by chance, when a local museum asked him in 2015 to examine their marine reptile fossils. It was still in the rock, displayed in the collection. "Nobody knew what it was," he said.